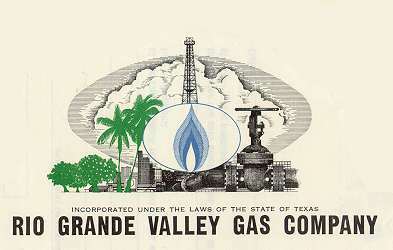 Beautifully engraved Certificate from the Rio Grande Valley Gas Company issued no later than 1968. This historic document was printed by the Security Banknote Company and has an ornate border around it with a vignette of and oil scene with a burning natural gas flame. This item has the printed signatures of the companies officers and is over 27 years old. 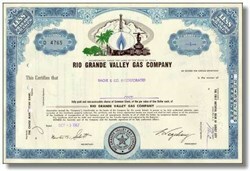 In September 1993, Southern Union Company acquired the Rio Grande Valley Gas Company ("Rio Grande") for approximately $30,500,000 (the "Rio Grande Acquisition"). Rio Grande currently serves approximately 75,000 customers in the south Texas counties of Willacy, Cameron and Hidalgo which includes 32 towns and cities along the Mexico border, including Harlingen, McAllen and Brownsville (the southernmost city in the continental U.S.). The Company initially funded the purchase with borrowings from its revolving credit facility which were subsequently repaid with proceeds from the sale of the Senior Debt Securities and the Rights Offering. See "MD&A -- Liquidity and Capital Resources."